1. Should I order a calibrated sensor? Standard uncalibrated sensors are somewhat non-linear and hence the relationship of applied force against output does not follow a straight line and in fact is curved (Left Image). Furthermore, a standard sensor’s full-scale output is only approximately in-line with the full-scale load. Calibrating the sensor linearizes the output and ensures that the full-scale output matches full-scale input with a maximum deviation of 2%. See example below (Right Image). Calibration requires the electronics to be, and remain matched to the sensor for the duration of use. Therefore electronics and sensors can no longer be swapped. This is due to the calibration data being stored in the electronics’ on-board flash memory. If the sensor is damaged, the electronics has no future use. Cost – A calibrated sensor costs an additional $25 over a standard sensor. Standard sensor = $20 + electronics ($30) = $50. Repeatability – both sensors are repeatable (it is just that the calibrated one gives an output value closer to the true value). Drift. Where output signal slowly increases and is independent of the applied force, typically due to temperature variations or material creep – SingleTact creep is less than 2%. When would you desire calibration? 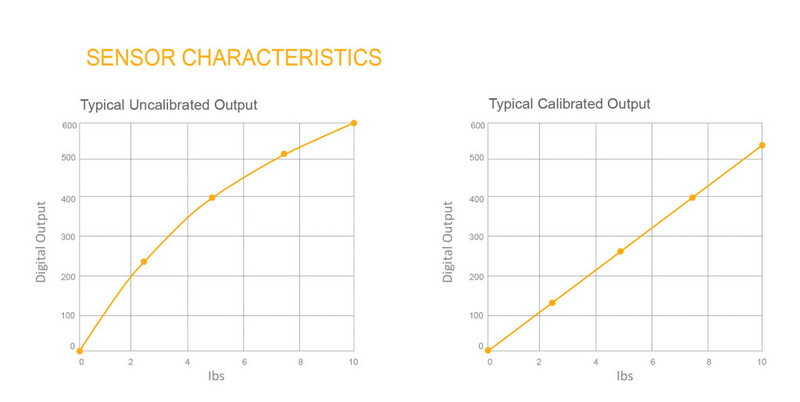 When accuracy and linearity are a main driver – calibrated sensors have improved linearity and accuracy. An instrumentation application example is where the output result should be accurate to 2%. Where an accuracy of 10% is satisfactory. An example application example is when using the sensor as a thin film button. If you are considering performing your own calibration method. If cost is the main driver. If you want to use a single set of electronics to evaluate multiple sensors configurations. 2. What do I do if my experiment’s contact area does not match the size of a SingleTact? SingleTact performance specifications assume that the whole sensor is uniformly loaded, so the sensor should be chosen to match the force contact area. That said, useful measurements can still be performed in a number of situations. 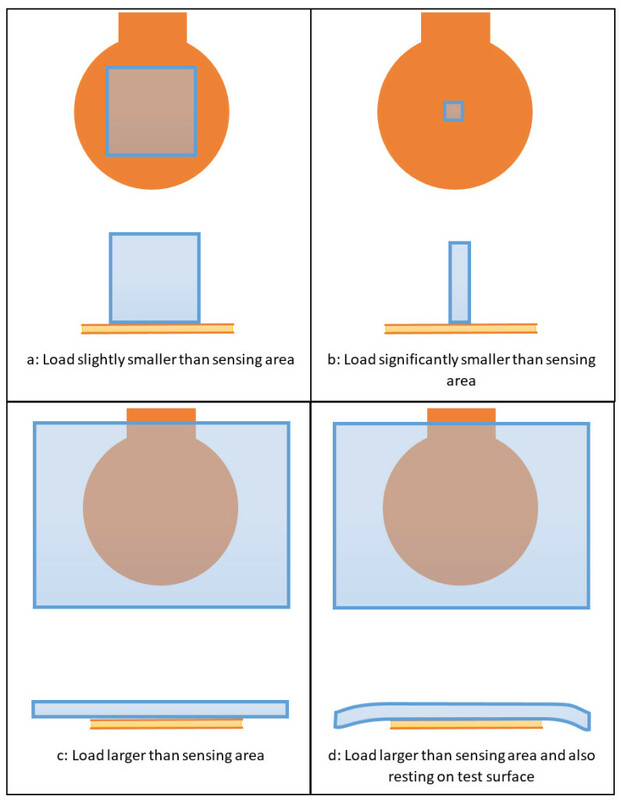 Consider the following four scenarios that show various loads resting on a SingleTact (from the top and from the side). The internal mechanical structure of the sensor is slightly non-linear. 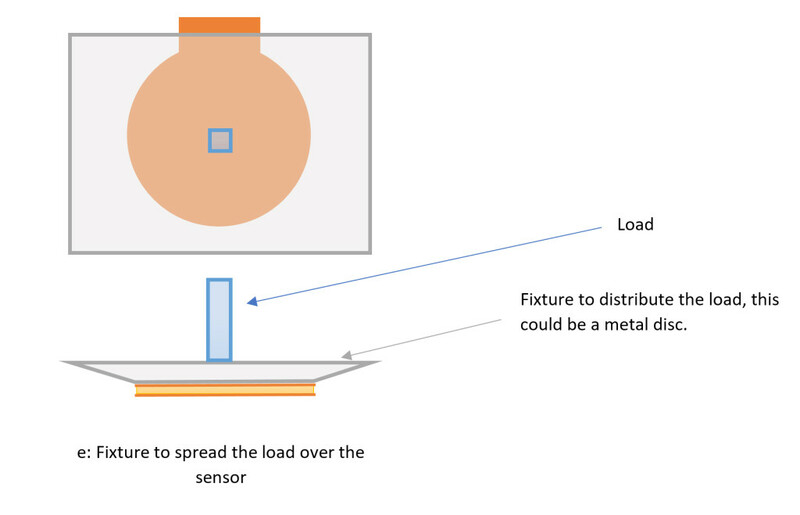 If the load contact area is reduced to a value smaller than the sensor area, the sensor performance begins to deteriorate significantly from the documented specification. Also in extreme cases, as the localised pressure increases there is a greater risk of forming a highly concentrated point load and piercing the sensor. If the load is larger than the sensing area (c) SingleTact will report the correct force. However, this is only true if the load is not also resting on the test surface as in (d). In (d), only a fraction of the load is applied to the SingleTact sensing area so it will report artificially low. Note, it is possible to create a fixture to evenly distribute the load over the sensor, for example (e). 3. What pressure range do I need? 1N approximately equals 100g, which approximately equals the weight of an apple. The pressure range should be chosen to closely match the anticipated pressure range. Applied loads greater than the selected full-scale range can damage the sensor. For optimum results we recommend you purchase our electronics. If you are making your own electronics the capacitance typically varies from 75pF to 78 pF for 8mm sensors and 230 pF to 236 pF for 15mm sensors.